This is an artist’s illustration of the 'chemical Caryatids'. Image: B. Smit/EPFL. Metal-organic frameworks (MOFs) are materials with nano-sized pores in their crystal structure. These pores allow MOFs to capture molecules so efficiently that they are now prime candidates in applications like carbon capture and water filtering. The main problem with MOFs is their mechanical stability. The materials are vulnerable to physical and chemical stress, which can affect their structure and, ultimately, their performance. Because many MOF applications involve cycling between different temperatures and varying pressures while exposed to chemical molecules that exert capillary forces, it has become paramount to the field that MOFs feature sufficient mechanical stability. Now, the lab of Berend Smit at Ecole Polytechnique Fédérale de Lausanne (EPFL) Sion in Switzerland, together with Lev Sarkisov at the University of Edinburgh in the UK, has discovered how the mechanical properties of MOFs relate to their structure. This finding, which is reported in a paper in ACS Central Science, overcomes a long-standing obstacle in optimizing the stability of the materials. For this study, the scientists focused on a popular type of MOF called ‘zeolitic imidazolate frameworks’, which are used in carbon capture, catalysis and even some drug delivery strategies. 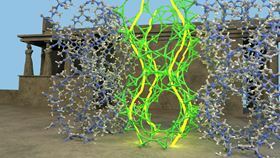 The team developed software that generates chemical structures, in order to design large numbers of these MOFs with different molecular structures. By then studying these virtual MOFs, the team was able to extract principles that connect the mechanical properties of a MOF to its structure, as well as design materials with enhanced mechanical stability. The researchers then ‘decorated’ the organic parts of the MOFs with a variety of functional groups, meaning groups of atoms that give a molecule (in this case, the MOF) specific properties. This part of the study showed that, depending on the pore structure, the same functional groups can either harden a MOF's structure and enhance its mechanical stability, or soften it and make it unstable. The key to the effects of functional groups lies in what are called ‘nonbonded interactions’, which occur between atoms with no chemical bonding. Nonbonded interactions include electrostatic and Van der Waals interactions, with the latter governing the formation of water droplets. The EPFL scientists found that nonbonded interactions play an important role in the stiffness of MOFs. This means that strategically placed functional groups can help tune the mechanical stability of a MOF by introducing extra connectivity between its atoms via nonbonded interactions. The authors describe the functional groups that help to carry the mechanical load applied to the MOF as ‘chemical Caryatids’, referring to the statues of women that acted as supporting columns for structures in ancient Greece, most famously those of the Erechtheion on the Acropolis at Athens. "The addition of a functional group may look a decoration, but if it is strategically placed, it provides an essential reinforcement of the MOF structure," says Smit "In our lab, we have developed the software that experimental groups can use to predict whether adding different functional groups enhances the mechanical stability of their material."